Performance Time: Approximately 25 minutes, 30 pgs. CHILDREN’S COMEDY. 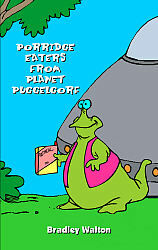 Four aliens from Planet Puggelgorf have devoted their lives to traveling through the universe in search of “porridge,” a mysterious substance they’ve heard of only in stories. The only clue the aliens have is from an ancient Puggelgorf fairy tale resembling “Goldilocks and the Three Bears” in which “porridge” appears to be a type of food that is often eaten out of a bowl. The aliens land on Earth, where they encounter a group of kids who help them locate a grocery store. There, the aliens’ quest for porridge appears to finally be at an end…until the sudden arrival of their arch-enemy, the Pusillanimous Porridge Pest! Bradley Walton coaches high school drama and forensics. Mr. Walton lives in Virginia with his wife, daughter, cats, and a whole bunch of comic books and Star Wars toys.